What causes a chicken to want to eat feathers? My chickens turned a year old this past August. During the winter months, I noticed one of my chickens lost a lot of vent feathers, all the feathers around her bottom and part way up her back and then had an open sore under one of its wings. The sore eventually healed, but she never grew back her feathers. I noticed that my head chicken, Lola, has a habit of plucking the other chicken’s vent feathers and then she eats them. She has also started to pluck the other feathers off the backs of the chickens that are molting. Now that winter is around the corner, I am afraid some of the chickens won’t have time to re-grow their feathers and will not survive the cold. I have trying spraying an anti-pick solution on the chickens, but when there are no feathers to stick to, it’s not helping much. Can you please let me know what I should do to prevent this from continuing? Should I keep Lola separated from the rest of the flock until their feathers re-grow? Does she need something nutritionally that she isn’t getting? Is it boredom? Feather picking can be so frustrating! 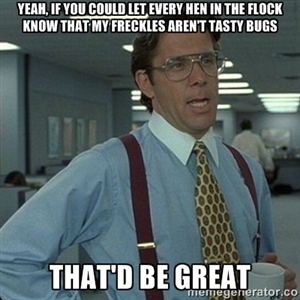 You have my sympathies, and so do your hens! Unfortunately, there is no ONE cause of feather picking. Feather picking can be caused by a number of things, so it won’t be possible for me to give you a definitive answer as to what is causing the problem in Lola. That said, we can go through the possibilities, and hopefully you’ll be able to narrow it down from there. 1.) Dietary issues can cause feather picking. You do mention that you considered this possibility, but you don’t share what type of feed you give them, so I can’t offer any insight as to the sufficiency of your hens’ diet. However, most often, if feather picking is a dietary issue, it’s caused by a lack of protein. Feathers (and eggs) require a lot of protein to produce; if a hen is not getting enough protein, she may begin eating eggs or feathers in an attempt to get enough. Commercial feeds are designed to have plenty protein for your hens, although different brands can vary a little. You could consider switching to a higher protein feed (say, 18% rather than 16%), or offering high protein supplements like live or freeze dried mealworms. For instance, it might simply be that you’re offering too many treats. Fruits and veggies, while good for your flock in small quantities, can contribute to feather picking when too much is given, because they’re typically quite low in protein. Reduce low protein treats and add high protein treats or feed. However, other dietary issues could be the problem–it’s not all protein! Methionine and cysteine, for example, are amino acids necessary for feather growth, so a deficiency in your flock’s diet can cause the same feather picking as a deficiency in protein. There is some evidence suggesting that your birds can get sufficient methionine from foraging, so allowing your birds increased access to pasture might be a good idea. Give your birds plenty of space to forage… especially when they match the autumn leaves! 2.) Boredom can cause feather picking. You don’t describe the type of environment in which you keep your flock, but if your birds don’t have sufficient space to forage, in addition to nutritional issues, they can get bored and ill-tempered, and begin picking on one another… even where their diets are fine. Feather picking may be Lola’s way of enforcing the pecking order and ensuring that the other girls give her the space she feels entitled to. A lot of times this type of behavior does start in the winter when the flock either has less access to the outdoors… or else their outdoor area is pretty barren during winter. You don’t mention what breed Lola is–or what breed your other girls are, either. It’s worth mentioning that “plenty of space” for some breeds is not nearly enough for others. Some breeds just prefer to forage widely and live in a less crowded environment. (If I were a chicken, I’d probably be from a breed that’s less tolerant of confinement, too–I love living out in the country!) If Lola is from a breed that just needs more space, you might try increasing the size of your run, for example. Having a large green area to forage will reduce or eliminate most feather picking. Not only does it give your birds much appreciated space and entertainment, but foraging will usually allow them to supplement their own diets (adding protein and amino acids) with greens and bugs they catch themselves. 3.) An infestation of mites or lice can cause feather picking. Check your girls over thoroughly to make sure they’re not suffering from mites or lice. They can often congregate around the vent and under wings, so when feather loss is occurring in those areas, external parasites are a definite possibility. Especially since there was a wound beneath the wing, it could be that a bad infested area got so irritated that it finally turned into a sore. Mites and lice can cause over-preening–birds even over preen themselves because they’re so itchy and miserable. Or possibly Lola is simply trying to help by preening out the offenders, and she’s being overzealous. Do your birds have a dust bathing area? That can help your flock keep external parasites at bay. You can read about how to treat for mites and lice here on our website. 4.) Feather picking can sometimes be—or can turn into—aggression or a simple bad habit. Sometimes feather picking may begin from one of the above causes (diet, boredom, parasites), but continue even after the problem is taken care of, because the hen has just made a habit of the bad behavior. As we all know, chickens just like to peck things sometimes. Other times feather picking may seem to develop spontaneously, from a transient cause we just don’t catch, or perhaps just from a bird’s own personality. When that happens, the habit can be very hard to break. For instance, I had a Rhode Island Red hen once that just couldn’t resist picking at leg feathers. Some chickens pick at birds with fancy feathering, like feathered legs, beards, tufts, crests and so on… and my Rhode Island Red was one. No amount of feather-pick lotion helped the situation. There were no parasites, and my flock has acres to roam. The other Rhode Island Red hens in my flock got along well with everyone. Eventually, I had to simply find a new home for my feather-picker in a flock that didn’t contain any feather legged birds. I hope that’s not the case with Lola, but it may not hurt—if you’ve exhausted the other possibilities—to give the other girls a break and separate her out for a while. Sometimes the cycle can be broken if another girl becomes head hen in her absence. When she comes back, the new leader may be able to set boundaries and keep her in line! HENS, I hope this can help you figure out what’s going on in your flock! Remember that even when you’ve taken care of the problem, it may be a while before your girls’ feathers grow back! Please let us know how it all works out. To write to Lissa with a pet chicken related question, send an email to info@mypetchicken.com, with the subject line “Listen Lissa.” Read details about how to submit a question here. « Emergency chicken bath. Wait, what? My two girls are missing feathers on their underside near the tail area, I don’t see any sores and they are not missing anywhere else. I am a first time Mom to my girls and they are about a year old, they have been with me for about 3 months. Should I be worried? Or am I a crazy first time mom! I would check for lice or other external parasites. Lice often like to cluster near the vent, and can cause feather loss when the birds overpreen. how do you treat a chicken for Lice? or check for lice? I have a flock of 19 at the moment. four have naked butts? We talk about how to check chickens for (and treat) mites and lice in the Chicken Help section of our website (follow the link). It’s probably a little more likely in most cases that they’re suffering from mites, rather than lice, so be sure to look for both!